I have changed my bond forecast again. Based on the low inflation numbers contained in the pricing of both the 10 and 30 year TIPs, the bond losses will be limited to the amounts projected by interest rate normalization, UNTIL THERE IS A MATERIAL INCREASE OR DECREASE IN INFLATION EXPECTATIONS! The yields on treasuries can only go up so far with inflation expectations running as low as they are now. Bond investors view the U.S. treasuries to be without a credit risk component built into the yield. All other bonds have a credit risk component and are priced off the yields of comparable maturity treasuries based primarily on the market's assessment of credit risk for taxable securities. Once treasury yields quit going up, the remainder of the bond market will likely settle down too. The break-even number for the ten year is currently below 2%. That number is the best market forecast for the average annual inflation rate. J.P. Morgan | Tips on TIPS It is a dynamic number and will change based on subsequent events. I am estimating that the 10 year will top out in the 4% to 4.25% within two years, so close to 1/2 of the total projected loss has already occurred in the move from a 5/1/13 yield of 1.66%. About a week ago in a SA comment, I estimated that the ten year would hit a temporary plateau in the 2.5%-2.6% range. The market will simply wait for more definitive news about unemployment and the economy before making a sustained move up or down from that range. Break-even is the difference in the real and nominal yields and represents the average annual CPI necessary for the buyer of the TIP to break-even with the buyer of the non-inflation protected treasury. Given the carnage in bond CEFs that has resulted in usually large discounts to net asset value per share, I changed several of my dividend distribution options for bond CEFs to reinvestment. Treasury notes and bonds recovered some late last week after the weaker than expected first quarter real GDP report and some comments by NY FED President William Dudley. Dudley comments: Federal Reserve Bank of New York; Reuters Dudley did not say anything different from BB. He did note that the Federal Reserve had been too optimistic in many of its prior forecasts and placed more emphasis on asset purchases continuing provided the economy heads down rather than up. In a surprise negative development, the government revised down first quarter real GDP to 1.8% in its final estimate, down from 2.4% in the second estimate. News Release: Gross Domestic Product Consumer personal expenditures were revised from 3.4% to 2.6%. The downward revision in PCE was driven by lower spending on services, including legal services (a good thing? ), personal care and health care. In his news conference, Bernanke linked the end of the FED's asset purchases to unemployment being in the "vicinity" of 7% "with solid economic growth supporting further job gains" (page 5: federalreserve.gov.pdf) He also made it clear that those asset purchases were for the purpose of jump starting the economy. Bill Gross believes that a 7% unemployment rate by the middle of next year is "a long shot". Barrons.com I would not view it as a long short but a probable event. I thought that I would just make a note and refer back to his prediction and mine next June or whenever the rates hits 7%. He also makes what I would label a silly argument that households will be under some kind of economic stress with the recent rise in mortgage rates, ignoring the tens of millions who have already refinanced at ridiculously low rates. Since the DJ-UBS did not gain more than 3% over its starting value, MKZ will pay its 3% minimum coupon on 7/1/2013. The ex interest date was 6/26. This unsecured senior noted issued by Citigroup Funding, and guaranteed by Citigroup as provided in the prospectus, will mature on 7/11/14. Par value is $10. As long as there is no close in the DJ-UBS Commodity Index over 165.61 (Maximum Level) on or before the END DATE, MKZ will pay the greater of 3% or the percentage gain in the DJ-UBS commodity index over its Starting Value (up to 31%). 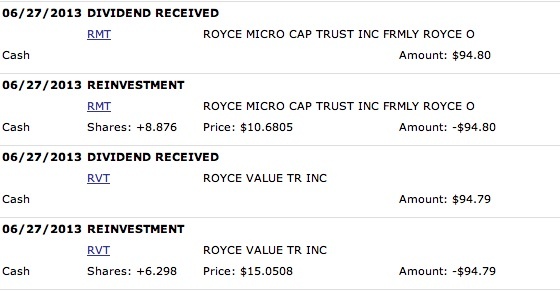 I own two closed end stock funds managed by the Royce fund group. I have changed my reinvestment option on RMT to payment in cash, simply because I do not want any more shares. The 10 annualized RMT performance is 9.25% based on net asset value, CEFConnect. 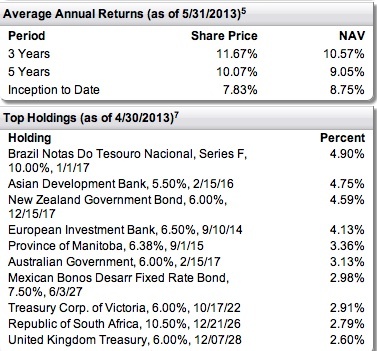 One of my two worst performing stock ETFs is the BlackRock Real Asset Equity Trust (BCF). This is not surprising given its ownership of commodity producers. 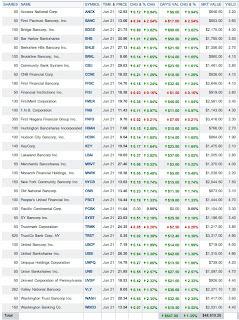 As of 3/31/13, this fund had a 37.4% weighting in metals and mining. It would be hard to find a recent winner in that industry sector. 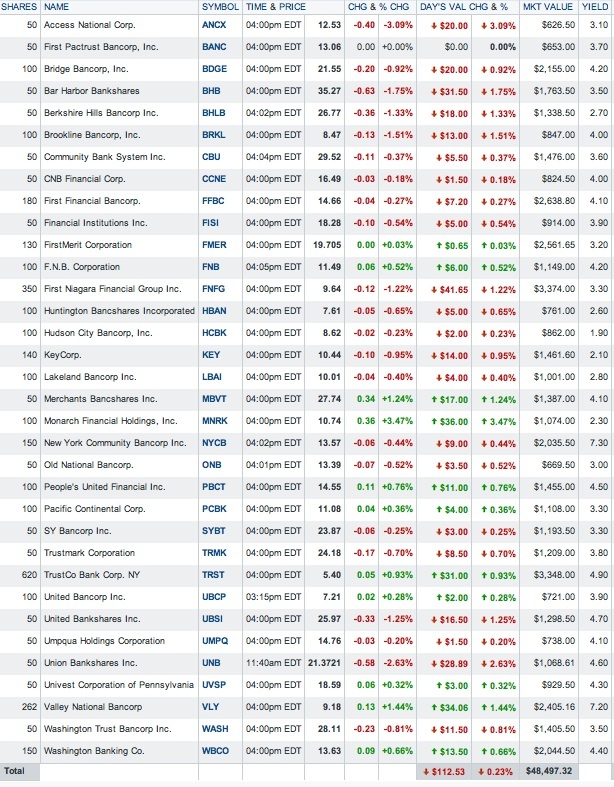 The top two holdings as of 3/31/13 were BHP Billiton and Rio Tinto. Fortunately, I sold out of my BCF position in the IRA before the price decline began in earnest. Item # 3 Sold 152 BCF at 10.38-Roth IRA (realized gain on the share=$223.02). TICC Capital (TICC) is a BDC. I own 250 shares, of which 100 are held in the ROTH IRA. I am not reinvesting the dividend on those shares. I have elected to reinvest at least temporarily the dividend paid by the 150 shares held in the taxable account, at least until the price consistently trades above $10. I recently averaged down in that taxable account: Added 50 TICC at $9.85 Net asset value per share was reported at $10.02 as of 3/31/13. This is a link to a recent Seeking Alpha article discussing TICC. I owned several bond CEFs in a regular IRA at Fidelity. I opened a ROTH IRA at that firm and moved last week five CEF positions from the regular IRA to that new ROTH IRA account. The largest loser was 100 shares of GGN. The market value of those positions at the time of conversion will be included in my taxable income in 2013, but the amount will be lower due to their loss in value since May 1. I did similar type conversions starting in October 2008 for a similar reason. Eventually, I will have to include the amount taken out of a regular IRA as income, but I can soften the blow by opportunistic conversions when the price of the asset has fallen significantly in value. Rationale: This is just profit taking in a non-core position, something that I routinely do. After selling my position, this negative article about Xerox was published by Seeking Alpha. At the time of purchase, I will establish a potential range for selling a small, non-core position like the 100 shares of XRX. A number of factors will influence the setting of a target price, including recent earnings reports, the strength and viability of competitors, the reliability and rate of E.P.S. growth, P/E and other valuation metrics, and a two year chart. The chart for XRX suggested to me that buy in the $7 to $7.5 or so range would be okay as an entry point and around $9.5 would likely be a decent exit number. XRX Interactive Chart I five year chart reveals a potential upside in the $10-$12 with $6.5 being the downside risk point barring really terrible news. I also noted when establishing a potential target price that the S & P report had slapped a two star rating on the stock with a $7 price target, so I did not want to set my sights too high. 2. Bought 50 NBB at $18.55 (see Disclaimer): In late May, I significantly reduced my exposure to leveraged CEF Build America Bonds funds by selling NBD, a functionally equivalent Nuveen BABs CEF to NBB. Item # 3 Sold 100 NBD at $21.86-Roth IRA The reason given for that disposition was my concern about a loss due to interest rate normalization. That disposition left me with 150 Shares of of NBB. I am now back up to 200 shares. While I avoided the subsequent loss in NBD, I recognize that further losses are certainly possible by acquiring shares in any leveraged BABs CEF, so I decided to limit my purchase to just 50 shares for now and possibly buy another 50 when and if there is another 10% loss in market value. I suspect that the carnage could continue awhile longer in the intermediate term maturities, but the decline in longer term bonds could start to slow based on their own normal spreads to inflation expectations. As noted at the sponsor's website, this fund has a contingent term provision. If there are no new issuances of BABs or similar U.S. treasury subsidized taxable municipal bond within 24 months ending on or before 1/1/2013, and there were none, the fund will terminate on or about 6/30/20. NBB will consequently be a term bond fund that liquidates in about 7 years. The managers of this fund may have to be nimble trading long bonds as that deadline approaches. NBB is a leveraged fund. NBB Fund Data Page As such, the fund borrows money at the currently abnormally low short rates to buy long term bonds. That works out only when the value of those bonds purchased with borrowed money are not declining in price which has been the case over the past several weeks. Then the leverage causes the loss in net asset value per share to go down more. In an optimal environment, the fund can earn additional income based on the difference between the average yield of the short term borrowings and the yield on the bonds purchased with those borrowed funds. It is also important for the bonds purchased with borrowed funds to rise in value, creating capital gain opportunities. As of 3/31/13, the market value of NBB's assets was $732.719+M purchased at a total cost of $622.63+M (page 21). The net unrealized gain number would be much smaller now. 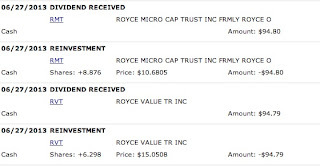 As of 3/31/13, the fund had only a net unrealized loss of $1.738M and an unrealized gain of over $111M, which just shows how well these bonds were performing before the worm turned in early May. Needless to say, the price of this long term bond fund has tanked since the bond rout began, falling from a $21.8 price as of 5/1/13 to a closing price of $18.7 last Monday. NBB Interactive Chart Adjusted for two monthly dividend payments, the decline in market price over that brief period was 13.87%. The net asset value per share, adjusted for the two dividends, declined over the same period from $23.2 to $20.887 or 9.97%. During rapid declines in net asset values, I would expect that the percentage decline in market price to significantly exceed the percentage decline in net asset value per share. 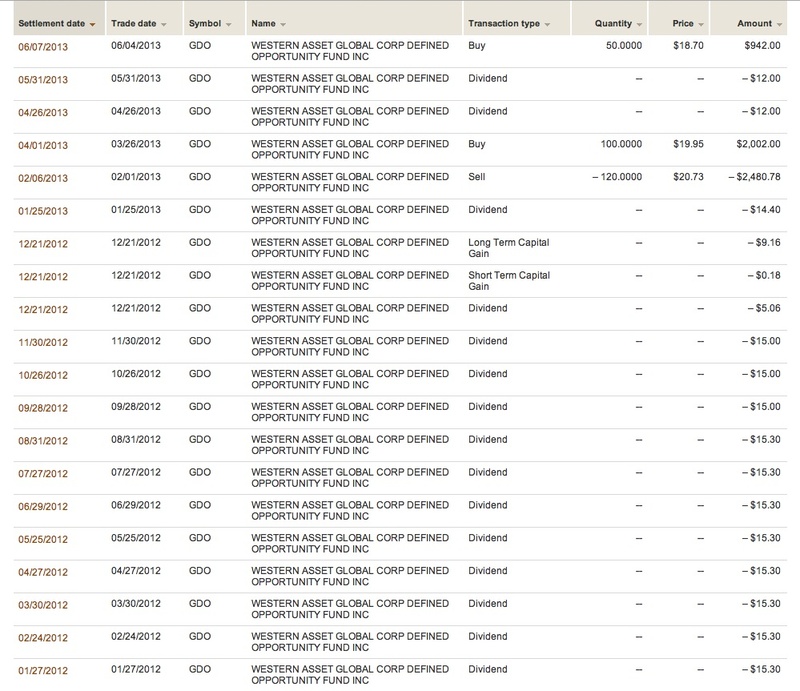 The fund is currently paying monthly dividends at the rate of $.1135. The CEFConnect page shows that this dividend has been supported by income. Assuming a continuation of that rate, which is in no way assured, the yield would be about 7.34%. The average duration is shown at 9.86 years, with an average maturity of 27.56 years. This fund has a lot of interest rate risk. As of last Friday (6/28/13), the discount to net asset value per share narrowed to -7.32% based on a NAV of $20.89 and a closing share price of $19.36. CEFConnect shows the average duration at 9.86 years. I have realized gains in this security to date of $184.16 (snapshots at Item # 1): Sold 100 NBB at $20.13-ROTH IRA November 2011; Added 50 NBB at $19.55 in the ROTH IRA September 2001; Sold 100 NBB at $20.07 November 2011; Bought Back 50 NBB @18.4 in IRA December 2010; Sold 50 NBB @ 19.24 in the Regular IRA December 2010; Bought 50 NBB @ 19 November 2010; Bought 50 NBB at 19.67 June 2010. Rationale: I am simply attempting to earn some income generated by a high quality bond portfolio. A lot of the losses due to normalization have already occurred in the long term bonds. While more can be reasonably anticipated, the amount is likely to be less than in the intermediate term bonds that are further away from normalized rates. I was also able to buy NBD at greater than a 10% discount to its net asset value per share which provides some insulation against further deterioration in NAV but not to an increase in the discount due to market fluctuations. Still, I have sufficiently impressed by the downdraft in both market prices and net asset values to slice an order now into small parts that will at least allow me psychologically to buy another odd lot at a lower price without being concerned about the pre-existing unrealized loss, which would be insignificant given the purchased share amount. Risks: Anyone unaware of the risks associated with leveraged bond CEFs has had a rude awakening over the past several weeks. Net asset values per share have plummeted due to the rise in intermediate and long term interest rates, and that rapid descent is of course exacerbated by borrowing money to buy more of a declining asset. BABs are also long term bonds and the long maturities are particularly subject to interest rate risk. So far, however, the rise in rates has pretty much hit all intermediate and long term maturities roughly the same, an expected result when the rise is not due to inflation expectations increasing but due solely to interest rate normalization. Another possible risk or benefit is the 2020 liquidation date. If the bonds owned by the fund are higher than now as that liquidation data comes around, then that would provide a possible capital gains opportunity for a long term shareholder, defined as someone other than the OG. The risk is that the bonds would be declining in price. However, if the inflation forecast embodied in the seven year TIP proves prescient, currently at 1.9%, then it is hard to see much damage if any coming from rising rates due to inflation. The price damage would then be the anticipated damage from interest rate normalization. Another potential risk arises from the sequester. Some of the BABs have provisions that allow the issuer to redeem the bonds in the event the federal government cuts its subsidy which has happened due tot he sequester. MSRB MSRB Reminds Investors, Market Professionals to Assess Terms of Build America Bonds and other Direct-Pay Bonds in Light of Federal Sequester I would not say that there is yet an avalanche of redemptions but several issuers are apparently contemplating redemption. More Issuers Contemplate BAB Redemptions The federal government is still paying most of its subsidy; and long term interest rates have already gone up. This last risk is sufficient, however, to keep my exposure to BAB bond funds low. The average price of the bonds owned by NBB was 134.18 as of 4/30/13, less now, so any redemption at par will likely cause a decline in net asset value. I discuss this risk in a September 2012 post: Introduction Stocks, Bonds & Politics. Security Description: Citizens & Northern is headquartered in Wellsboro, Pennsylvania and is the holding company for the Citizens and Northern Bank which has 25 branch offices in seven PA counties and one in NY. The last quarterly dividend payment was $.25 per share. SEC Filed Press Release At that rate the dividend yield at a total cost of $19.15 is about 5.22%, one reason for buying some shares. The general idea is for dividends to account for approximately 40% of my total return over the life of this basket strategy which started in mid-2009. The bank owns each of its branch facilities except for two that are leased. (page 7) I view that positively. Last Earnings Report: I may regret buying this one back after realizing a good profit on just 100 shares. The last earnings report had some items going the wrong way. Hopefully, the rise in intermediate and long term rates will have a beneficial impact on net interest margins later this year, as the cost of funds from depositors continues to hug zero. Some of the compression in net interest margin was due to a lower average loan balance and a decline in deposits, both viewed negatively by me. Only one analyst provides earnings estimates. For 2013, that analyst forecasts an E.P.S. of $1.62 and $1.58 for 2014. CZNC Analyst Estimate Hopefully, the bank will beat the 2014 forecast and generate at least single digit E.P.S. growth Y-O-Y. Rationale: Since regional banks have been performing well lately, even on significant down days for the market, I decided to take my exposure up a tad by adding back a small position in one previously sold at a good percentage profit. CZNC also has an above average dividend yield. Risks: The main risk is probably E.P.S. stagnation or worse, a continued decline in E.P.S. numbers Y-O-F. That kind of action has already left CZNC in the dust as other regional bank stocks have rallied over the past several days. There are the usual risks associated with banks, including boneheaded loan decisions, contraction in net interest margin due to a variety of factors including but not limited to the QE, a lower deposit base (banks pay depositors almost nothing now, so a lower deposit number is not good for net interest margins), and/or lower loan generation. Recessions are also bad news for banks, as loan losses accelerate. A more benign environment would be increasing deposits, which costs the bank almost nothing given ZIRP, coupled with increased new loan generation at higher yields. CZNC's loan and deposit number for the last quarter were going in the wrong direction and hopefully will improve in the subsequent quarters. 4. 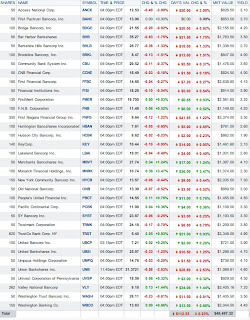 Added 50 GDO at $17.58-Roth IRA (see Disclaimer): I have repeatedly bought and sold this bond CEF. I successfully exited my position last February by selling 120 shares at $20.73, noted in the preceding snapshot, and realized a gain of $340.33 (snapshot at item # 4 Sold 120 GDO at $20.73) I then had a less than optimal re-entry with two subsequent purchases: Bought Back GDO at $19.95-Roth IRA (4/1/13 purchase); Bought ROTH IRA 50 GDO at $18.7 (6/7/13 purchase noted above). The downdraft in both market price and net asset value was swift. Security Description: The Western Asset Global Corp Defined Opportunity Fund is a closed end bond fund that uses a modest amount of leverage, last reported at less than 15%. The fund uses a small amount of leverage. Unlike most bond funds, GDO has a term date. The fund will liquidate on or about 12/2/2024. This gives the fund one of the characteristics of owning an individual bond, the promise to pay the investor at a time certain. Unlike the individual bond, however, this fund does not promise to pay a specific sum at a future date. The investor is GDO will receive their pro-rata share of the liquidation proceeds, which may be more or less than the current net asset value per share. Links to the sponsor's web page will not work when provided here in this blog. The relevant page can be found by following the sponsor's link at CEFConnect. CEFConnect Page on Distribution History: As previously noted, the monthly dividend was recently cut to $.115 per share from .12. This fund appears to be making an effort to avoid return of capital distributions, and I am fine with that approach. GDO closed last Friday at a -8.6% discount to net asset value per share, based on a NAV of $19.89 and a closing market price of $18.18. That information can be found under the "pricing history" tab at CEF Connect. Rational: I am just going to copy a previous discussion on both the rationale and risks. Obviously, recent events highlight the risks, but the rapid decline also makes this bond more attractive for current income too. This fund does have several advantages. I was able to buy it at a discount to net asset value. Many CEF bond funds sell at a premium to net asset value. If I held the fund until the liquidation date in 2024, purchasing GDO at a discount may enhance the profit or lessen the loss. I also juice my dividend yield by buying the fund at a discount compared to a bond mutual fund selling at net asset value. Yield is currently being juiced by the the spread between short term borrowing costs and the yield on bonds purchased with those borrowed funds. The portfolio is well diversified which lessens credit risk compared to owning a few individual bonds. The duration is relatively short which will mitigate interest rate risk. While the fund has significant junk bond exposure, the fund is weighted in BBB rated or higher bonds. Risks: I believe that readers of this blog are fully familiar with bond risks. The two major risks involve a rise in interest rates and credit risk. Since this fund invests in foreign bonds, currency risk, primarily involving the Euro, is an important risk. As I have mentioned several times previously, I would anticipate that the dividend rate will gradually decline and that decline will likely accelerate as the fund nears its 2024 liquidation date, as the managers shorten the duration. West Bancorporation recently repurchased 1,440,592 shares at $10.95 from the insurance company American Equity Life Holding Company. The total consideration of $15.774+M will be financed using borrowed funds. Only two analysts provide earnings estimates. Their consensus forecast is for an E.P.S. of $.94 in 2013 and $.94 in 2013. WTBA Analyst Estimates For the shares to gain much traction from the current level. the bank will need to beat that 2014 forecast by at least six cents. Otherwise, the shares are probably close to being dead money for now, except for the dividend. As with a large number of small regional banks, the stock priced topped out in 2006 rather than 2007, which was in retrospect an early warning of things to come. WTBA's high price was in April 2006 at $19.88. The bottom was hit in the Fall of 2009 at around $4.4 and the stock has been moving steadily up in fits and starts since that bottom, moving in what I would call a 45 degree positive angle. NPL and NPA ratios for March 2012 quarter taken from 2012 first quarter 10-Q at page 36 WTBA-2012.03.31-10Q. Rationale: This small regional banks stubbed its toe during the Near Depression but is well capitalized with an excellent Texas Ratio. The recent stock repurchase adds some risk since it is being funded with additional borrowings but will significantly reduce the share count. As of 3/31/13, there were 17,403,882 shares outstanding. The small position in this bank also gives me some geographic diversification in my regional bank basket. WTBA is my first Iowa based bank. I did note that the Board "accepted the resignation" of its Chairman and CEO in July 2009. SEC Filed Press Release Part of the 2009 loss was due to a $23M goodwill impairment associated with prior acquisitions. 2009 2nd Q Earnings Press Release (bank also took a $15M charge for loan losses in the 2nd Q of 2009). 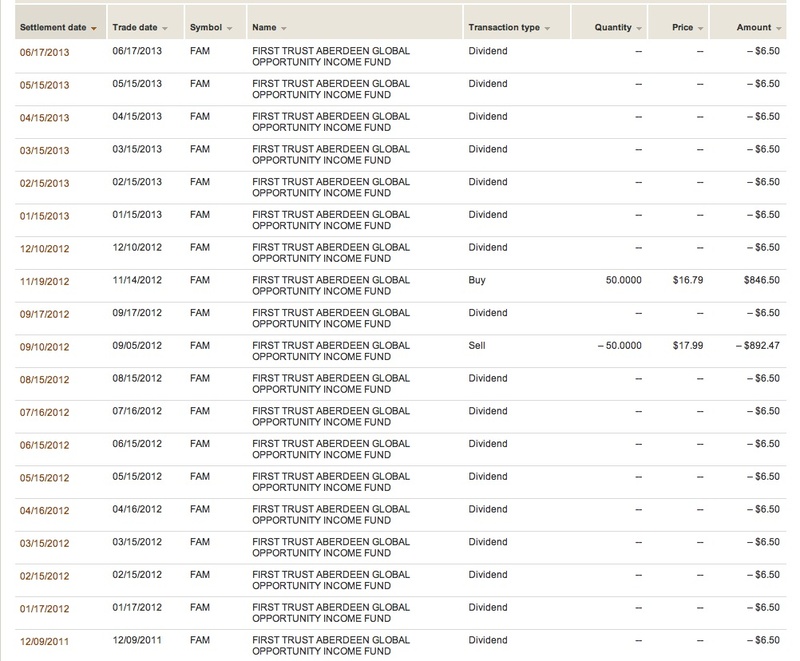 This loss reduces my realized gain for this basket to $11,873.37 but also increases my unrealized gain. The unrealized gain is now over $5,300 excluding any gains or losses from shares purchased with dividends which I am not tracking in my YF table. The regional bank basket was easily my best performing sector play during June. The two largest unrealized losses are in VLY and FNFG, both hovering in the $700 to $800 range depending on the day. The unrealized loss in FNFG has been going down since that bank sacked the CEO. The Lottery Ticket and Regional Bank Basket strategies are updated on the last Monday of each month. I did not realize that today was the last Monday in June until earlier this evening. The prices shown in the tables below will be the closing prices from today. My total exposure is less than $6,500. Perhaps, if the market continues melting down, I will see more opportunities than I do now. There were no buys or sells since the last update. Capstone Turbine surged in price after announcing that it had received a "major" order from a real estate company (Related Companies) for its turbines. Capstone Receives Major Order for Global Real Estate Development and Investment Firm. For some time, CPST has had success selling it products to oil and gas drillers, particularly those operating in remote locations. The order from the global real estate company for installation at its projects may be (or may not be!) a turning point in the appeal of CPST's turbines to a broader customer list. "Has Capstone Turbine Finally Turned the Corner?" Other recent orders are discussed in these press releases. The company has yet to produce an annual profit. The current consensus estimate is for a $.07 loss for its F/Y ending in March 2013 and for zero cents in the 2014 F/Y. CPST is scheduled to report its fiscal 4th quarter results, estimated to be a 1 cent per share loss on $36.3M in revenues, on 6/13/13. Capstone Turbine announced its 4th fiscal results after the market's close on 6/12/13. 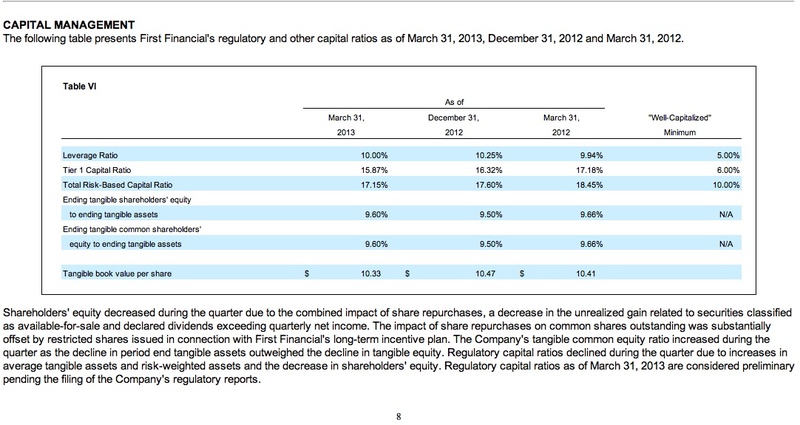 The net loss was $.01 per share on revenues of $35.4M, compared to a 3 cent per share loss in the year earlier quarter. Revenues increased 18% from the year earlier quarter. The consensus estimate was for a 1 cent per share loss on $36.3M in revenues. I left some less than enthusiastic comments to a recent article about STKL published by Seeking Alpha. Needless to say, the dividend yield for each position is higher than the 2.54% yield on the 10 year treasury as of last Friday's close. Standard Chart - WSJ.com Most of the dividend yields are higher than the 3.56% yield on the 30 year treasury (Standard Chart - WSJ.com), and many of these banks are raising their dividends. A buyer of that 30 year treasury bond with a 3.56% is stuck with that yield until the bond is sold. First PacTrust completed the sell of non-cumulative equity preferred shares with a 8% coupon on a $25 par value. I discussed that preferred and another new one in comments to this Seeking Alpha article. First PacTrust also sold 3,553,846 shares at $13 per share with an over allotment option of up to 360,000 shares. That offering did cause a small decline in the market share price to that offering price. B. Added 50 FNB at $11.25 (see Disclaimer): FNB operates 250 branches in six states and three major metropolitan areas including Pittsburgh, Cleveland and Baltimore. I am averaging up with this last buy. Bought 50 FNB at $8.42; Bought 50 FNB at $9.36; Pared FNB: Sold 50 at $10 and 50 at $10.18 (December 2010). Since that sale of 100 shares in December 2010, I have continued to read FNB earnings reports and have decided to repurchase 50 of those previously sold shares. C. People's United (own): JPM reiterated its overweight in People’s United (PBCT) and raised its price target to $15.5 from $13.50. FirstMerit (FMER) hit a 52 week high today. What can I say about last week except that I took a licking and kept on ticking. Stocks needed a correction. I would much prefer to avoid all of this drama, as I recently stated in a SA comment, and just have the S & P 500 go up 6% per year, adjusted for inflation and with dividends reinvested, with the precise and equal increment in price to achieve that result over the course of a year determined by a panel of our most skilled nerd machines. Is that going to happen? I have been calling for carnage in bond land, not due to a rise in inflation expectations which have been declining, but due simply to interest rate normalization. A lot of people want to argue with me about that really simple concept, apparently due to a failure to remember history, as in the last century of pricing, yield and inflation data used by investors prior to the FED interjecting itself into the credit markets. The chief investment officer at TCW for fixed income noted in an interview published by Morningstar that the recent rise in interest rates were a "dress rehearsal for the end of QE" and the end of QE will cause a "sea change in valuations". He also refers to the possibility of institutions starting to front run the FED that could lead to a rapid increase in rates. In a free market uninfluenced by QE, I have mentioned that 2.5% is an average spread over the anticipated inflation rate for the 10 year treasury. That is simply a well known rule of thumb. Someone could go back and see how that number compares with past data using this process. The market is dynamic so the forecasts will change above and below that level based on other considerations besides the inflation forecast, such as flight to safety or the level confidence in the inflation forecasts. I would generally expect the ten year nominal yield spread to move close to 2% during periods where the CPI numbers and 10 year inflation forecasts are running fairly consistently in the 2% to 2.5% range. The spread would then start to move up when actual CPI numbers start to accelerate toward 3% and above, causing the inflation expectations to move higher and possibly increasing the uncertainty component. And the spread range could move below 2% with persistent readings below 2% in the inflation rate. As investors have more uncertainty due to accelerating inflation numbers, consistently higher than the previous range, then more protection against inflation, manifested by a larger spread number, would be needed to allay those concerns. Inflation has been consistently modest since the FED started to sell 10 year TIPs that would cause the spread to be closer to 2% than over 2.5%. The FHFA reported that Fannie and Freddie completed almost 460,000 refinances in March 2013, with nearly 100,000 completed under the HARP program. The two GSEs completed almost 1.4 million refinances in the 2014 first quarter. March 2013 Refinancing Report From 4/1/09, Freddie and Fannie have refinanced 16,185,748 mortgages. CPI rose .1% in May on a seasonally adjusted basis with the core rising .02%. Consumer Price Index Summary Over the 12 month period ending in May, CPI has increased 1.4% before seasonal adjustment. While the market reacted negatively to the signal that QE will end, there was nothing surprising to that development. The Fed will taper QE before ending it. Intermediate and long term treasuries yields will rise to normal levels over the next 1-2 years, as investors start once again to price those securities using traditional criteria including inflation expectations. The reset process for interest rates across the entire bond spectrum began in early May 2013 as some investors started to front run the inevitable end of QE. If the unemployment forecast proves prescient, then the FED will likely start to increase the federal funds rate before 2015. HSBC's manufacturing PMI index for China slid further into contraction territory with a 48.3 reading in June, down from 49.2 in May. The Markit flash June U.S. manufacturing PMI, which has been running higher than the comparable ISM index, was reported at 52.2, with the new order component increasing slightly to 53.7. The Philly reported that its regional manufacturing rose to 12.5 in June, the highest reading since April 2011 from a -5.2 reading in April. Any number over zero indicates expansion. June 2013 Business Outlook Survey - - Philadelphia Fed The new orders component increased from -7.9 to 16.6. Early last week, there was a report from a Fitch analyst that China's growth was fueled by a credit bubble, unlike anything seen in history. It is unusual for an already large economy to grow continuously at high levels without having a really severe contraction. FITCH I am more worried more about China than Europe. The analyst argues first that China's shadow banking was so opaque that no one really knew what was happening, but then seems to know with certainty that credit has jumped 75 percentage points to 200% of GDP over the past five years. I suspect that she is close to being right that additional debt has lost its punch, as she estimates that a Yuan of borrowing produces only .15 of GDP growth, down from .85 four years ago. While those numbers could easily be off by a lot, the trend would be in the direction claimed by the analyst. The cover story in Barrons highlights some of the aforementioned problems. The declines are not adjusted for any dividend payments. Duration numbers are from the ETF sponsors. How many years of dividends have been wiped out by a 12.59% decline in price? TLT owns treasuries with an average maturity of 27.55 years and a duration of 16.63 years. I attempted to calculate an estimated loss using the rise in yields for the 20 and 30 Year Treasury Bonds between 5/1/13 and 6/21/13 using the rule of thumb of multiplying the rise in rates by the duration. I came very close to calculating the actual loss in TLT. The maturity of the bonds is closer to 30 years at 27.55 than to the 20 year treasury so a slight increase over the 12.14% was expected given the greater rise in yield for the 20 year. A story published in Barrons on 6/13/13 noted a $3.3 billion outflow from junk bond funds in the prior week. Another Barrons.com post published a week later noted the huge outflow from bond funds. For a long time now, I have been forecasting that the 10 year treasury will hit 3.5% within a year and 4.5% in two years. After studying the 10 year TIP and nominal pricing between 2003-2007, I now view it unlikely that investors will demand a 2.5% spread to the anticipated inflation, given the current low average ten year CPI forecasts embodied in the 10 year TIP price and the recent declines in both the CPI and PCE price index. I have consequently lowered my range to 4% to 4.25% within two years. That reduced forecast will still cause significant losses even to the buyer of the ten year note last Friday at 2.5% (about 15.5% or so at a 4.25% yield), assuming my future forecast proves to be prescient. Future forecasts are inherently subject to error, but I need to assign probabilities to my future scenarios in order to make intelligent asset allocation decisions now. I will only weight my allocation decisions based on probabilities. A 50% to 70% chance of an event happening will cause a larger shift than say 30% to 40%. It would be rare for me to shift completely out of either bonds or stocks, coming really close to a 100% shift out of stocks only in 1999 since I reinitiated stock purchases in July 1982 after at least a four year hiatus. Since I viewed an increase in rates due to rate normalization to be a high probability event, I reduced both my bond duration and my bond allocation. However, I am far less certain on the decree of increase so I still own individual bonds and bond funds. The inflation forecast was close to 2.5% at the start of this year. The decline in inflation expectations is something that needs to be monitored everyday now, since the market is flashing a yellow light on deflation. A continuation of this lowering trend will likely have an impact on my bond allocation, as in moving up rather than down. You can see how the curve has steepened by checking the box "select to compare dates" and enter May 1, 2013. Ask yourself this question? If an institution bought a 10 year treasury at par with a 1.75% coupon, would it wait for rates to normalize to say 4% within the next two years before selling that low yielding security? That turned out fine. I received about 10% in interest for slightly over 2 years and three months. This 9.875% coupon bond was purchased on 3/7/2011. I still own two outstanding Travelport bonds. I own a few mutual funds. It is the one investment category where I always reinvest the dividend. I will sometimes engage in widespread eliminations and parings, which was the case in 2007, and thereafter establish new positions which was the case in 2009-2010. 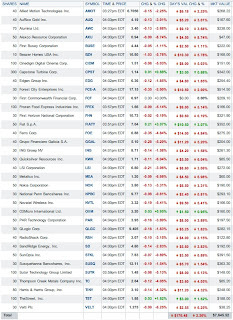 Snapshot of Position as of 8/3/12 can be found in Item # 4 Stocks, Bonds & Politics. 1. Added 50 RDS/A at $65.99 (see Disclaimer): I was able to buy this stock for my 90 year mother at two dollars less per share last Friday, proving once again that she is a better trader than me when buying for my personal account. Royal Dutch Shell PLC ADS Cl A is one of the largest corporations in the world with a market capitalization of close to $207B based on last Friday's closing price. I am reinvesting the dividend. So far I have avoided the Dutch withholding tax by reinvesting the dividend to buy additional shares. I know own RDS/a in two separate accounts. This last purchase was made in the main taxable account and I may add more shares in that account on further weakness. YF does not have earnings estimates for Royal Dutch so I pulled that data from Reuters. The analyst are not forecasting any earnings growth from 2013 to 2014. I would not put much weight into future forecasts for large integrated oil companies giving the volatile prices for their products and their many moving parts. This is a link to a Seeking Alpha published in June which contains some recent data points. I would agree that Shell's natural gas exposure has contributed to mediocre results lately, but I do expect a super cycle in natural gas demand to occur. It is only a question of when the demand will cause a sustainable increase in price, soaking up the excess supply, independent of weather issues. Sorry, do not know when that will happen, but the demand will be increasing significantly in the coming years, with substantial increases in demand coming from electric utilities increasingly using natural gas as a fuel for baseload generation (running 24/7), rather than the long standing temporary use of gas turbines to meet peak demand. Currency Risk: RDS-A is an ADR. Its value will be determined by the ordinary share's price in Euros converted back into USDs. One ADR equals two ordinary shares. The ordinary shares closed in Amsterdam at €24.24 -0.14 (-0.57%). The movement in the ordinary shares and the exchange rate will cause temporary differences in pricing between the two markets. I would have to be plugged into the exchange with a computer programmed to take advantage of temporary price dislocations to pick up the ADR at a €.29 per share discount to the ordinary share price. 2. Added 50 FFBC at $14.65 (REGIONAL BANK BASKET STRATEGY) (see Disclaimer): I noted in my previous post dealing with the Google Search box that several regional bank stocks were rising last Thursday when the major market averages were diving deep into the red. My basket ended up close to break-even for that day. Last Friday, when the S & P 500 rose .27%, my regional bank basket rose $647.08 or 1.35%. That sector was one of my few bright spots from last week. While determining cause and effect is always uncertain and subject to reasonable disagreements and to error, I suspect that the market views the rise in rates to be a positive for my regional banks. I addition to adding 50 shares to my FFBC position, I added a 50 share lot to another one that I will briefly discuss when I update the regional bank basket table. As previously noted, FFBC is paying both an ordinary and special dividend at the current time, but may discontinue the special dividend after this year based on its prior guidance. The special dividend is the difference between the regular dividend amount and the earnings per share, resulting in a 100% dividend payout ratio. The last quarterly dividend payment consisted of the regular 15 cent per share dividend and a special dividend of 9 cents which was paid on 7/1/13. Prior Trades: I am slightly under water with this one. My next trade would most likely be the sell of 50 shares over $16. I am reinvesting the dividend. I have sold my highest cost shares at a small profit. Bought 50 FFBC @ 16.85-Sold 50 FFBC at $17.51. My dividend reinvestments are all over the place. The earnings numbers for the last quarter were unsatisfactory. The bank did incur $2.9M in unusual pre-tax expenses relating to its "efficiency initiative", offset in part by $1.5M in realized gains from selling securities. The net negative impact was $.02 per share. As one would suspect, an efficiency initiative includes a reduction in employees. All of the following numbers are in need of improvement but I will withhold criticism until I see results in the 2014 first quarter which should reflect the "efficiency initiative", an improved net interest margin and hopefully no further unusual expenses that impact negatively the metrics that are important in my evaluation. 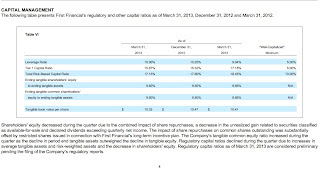 The bank repurchased 249,000 shares in the first quarter at an average cost of $15.39, down from the 460,500 shares bought in the 2012 4th quarter at an average cost per share of $14.78. Security Description: The SPDR SSgA Income Allocation ETF Fund is a world balance ETF focused on income generation. 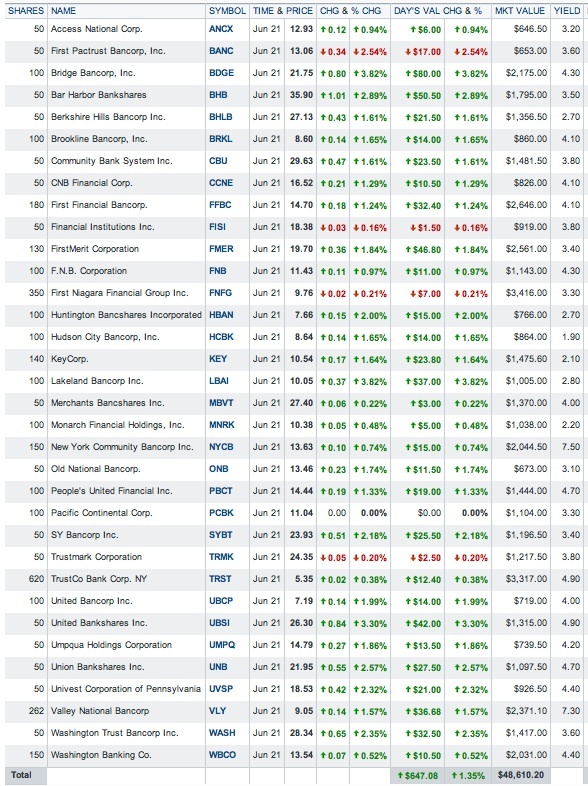 The fund sponsor shows the dividend yield at 3.98% as of 6/20/13. As of 6/20/13, this ETF had a 48.62% weighting in several bond ETFs and one "preferred stock" ETF. Future Buy: I will likely buy one this one back when I am more comfortable that the interest rate normalization is near an end. The bond part of the portfolio is generally high quality investment grade. I do not have a target price for re-entry, but would consider a buy when and if the dividend yield crosses 4.5%. 4. Sold 50 FVL at $15.53 (The $500 to $1,000 Flyers Basket Strategy) (see Disclaimer): The First Trust Value Line (R) 100 Fund Fund is an ETF that owns the 100 stocks that are given by Value Line its top rating for timeliness. Rationale: The main rational was just to take a profit in an immaterial position. As noted when I bought the shares, this is a momentum based ETF that has not performed well over the past several years. I may come back to it at a price lower than my last purchase. 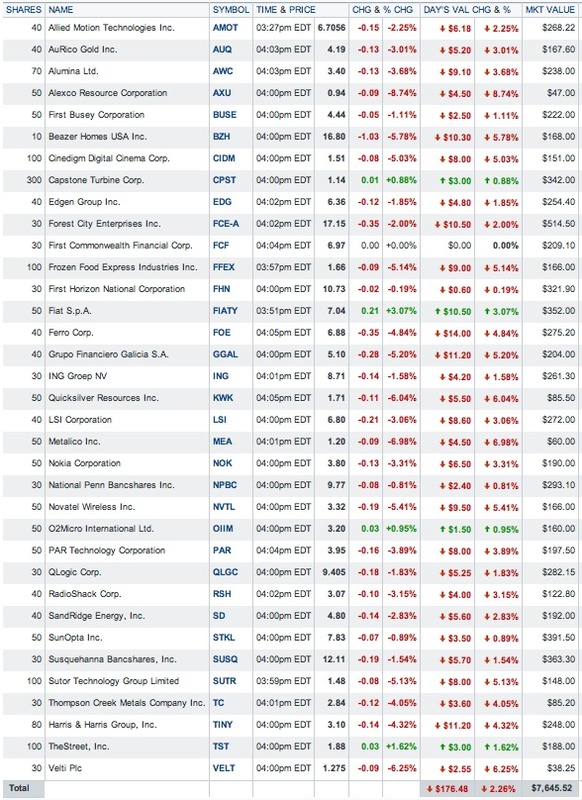 Future Buys: Probably only a small 50 share lot below my last purchase price. 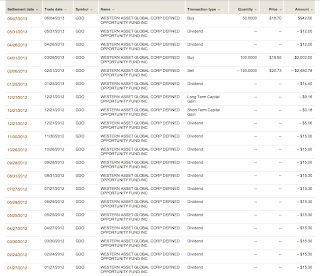 New Mountain Finance is a holding company that owned, as of 3/31/13, a 73.5% interest in an operating company known as New Mountain Finance Holdings, L.L.C. (Operating Company) with the remaining interest in the Operating Company owned by AIV Holdings. It is AIV Holdings who sold the 4 million shares. Before that offering, AIV was reported to own 16.221+M shares of New Mountain or 40%. (Prospectus at page 143) That prospectus has the effect of registering the remaining shares own by AIV and certain individuals. This BDC is discussed in this Seeking Alpha published in March. Risks: If someone really wants to know about BDC risks, a good place to start would be the Annual Report for one. The risk section is an eye opener and I doubt that many individuals buying BDCs have ever read the firm's own descriptions of risks. Annual Report at pp. 24-57. It takes me a long time to read 33 single spaced pages. 6. Bought 50 FAM at $14.94-Roth IRA (see Disclaimer): It is hard to muster now the nerve to buy 50 shares of a leveraged bond CEF. Nonetheless, I found the courage yesterday, possibly not measurable in any objective sense, to bring my Roth IRA position in FAM up to 100 shares. With the plunge in emerging market currencies and bonds over the past few weeks, this bond CEF has highlighted its downside risks. Recent History Snapshot: I only took 1 snapshot so I did not capture my entire Roth IRA history for this security, which has been negligible anyway. After brining my position up to 100 shares, I did change the distribution option to reinvestment from payment in cash. This history shows the prior purchase of 50 shares at $16.79, back in November 2012, and a sell at $17.99 shortly before that purchase. 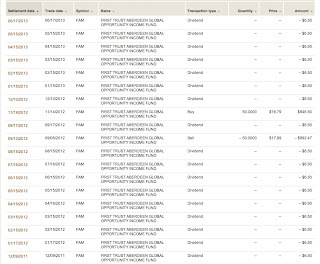 Sold 150 of 200 FAM at $18.64 October 2012 (see snapshot)-Bought 50 FAM @ 17.37 and Bought 100 FAM @ 17.9 (November 2010). Security Description: The First Trust/Aberdeen Global Opportunity Income Fund is a leveraged closed end international bond fund. Dividend: This fund pays a monthly distribution of $.13, supported in part by a return of capital. CEFConnect (distributions tab). At that rate, the dividend yield would be about 10.43% at a total cost of $14.95 per share. 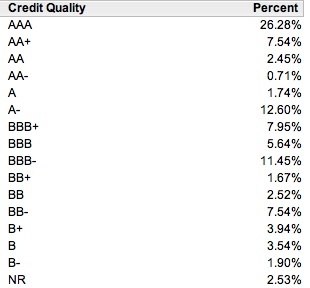 Credit Quality as of 4/30/13: The fund is weighted in investment grade securities. Rationale: It is all about the income. The downdraft in price since my last purchase enhanced the yield considerably. The credit quality is good. The discount to net asset value, which is not large for a bond CEF, has expanded beyond its 1 and 3 year averages and slightly below the 5 year average which included 2008 and 2009 when the discounts exceeded 15% routinely and had spiked over 25% at times. If the CEF bond fund is competently managed, the wild swings in local currency pricing can be mitigated simply by holding the bond to maturity, assuming no default of course. So if a Brazilian government bond maturing in 2016 is owned by the fund, and its value has sunk well below par value due to the recent turmoil, the manager of bond CEF has the option of holding that bond to maturity to collect the original principal amount. Currency risk would remain in that scenario however. The CEF manager does not have to sell a bond at an inopportune time in order to meet redemptions like managers of bond mutual funds and ETFs will need to do when faced with persistent net outflows. The currency risk can at least partially be hedged and FAM appears to be doing some hedging. With this last purchase, I missed the 14.78% decline in the share price since 4/30/13. Risks: The expense ratio is too high. A 10.79% decline in net asset value over a few weeks (see Rate of Decline above) is of course significant for a bond fund and does highlight the risks of bonds and the additional risks associated with foreign bond funds. There is certainly more downside risk, given that U.S. interest rates are rising and are likely to continue doing so over the next two years due to interest rate normalization. The upward move will be capped by the low inflation expectations currently predicted in the TIPs. Currency risks are always important in foreign bond funds. Those risks have been highlighted just over the past two months. The Australian Dollar has significantly declined in price against the USD since mid-April, as has the Brazilian Reel and Mexican Peso. The USD has gained a lot of value against these currencies over the past few weeks. The rise in US interest rates will likely place more pressure on those currencies, making foreign bond funds unusually risky over the next several months. This fund has some exposure to countries such as Argentina where country risk is a matter of concern. There are also the usual interest rate and credit risks associated with bonds, but the credit risks is more subdued given the investment grade bond weightings including the significant exposure to bonds rated "A" or higher. I will discuss a couple more transactions from last week in the next post. This one is plenty long as it is, particularly with the very long introduction segment.